Consumers see hundreds of ads and promotions every single day! Much of it occurs in the usual places such as ads in the morning paper, television commercials, radio pitches, billboards, bus stop signs and more. From the time we start our days with a morning cup of coffee, to the late night programs watched before we retire to bed each evening, consumers are inundated with messages and images. There’s a ton of clutter surrounding consumers. Billboard Magazine placed seven strings and an amp inside a urinal to people could make music when they pee. 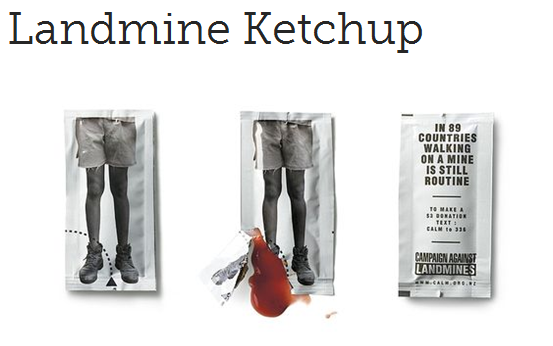 Publicis Mojo Auckland used a ketchup packet and sauce for an award-winning campaign against land mines. Accounting firm Ernst & Young pasted its logo on kids’ faces using a service from www.BuyMyFace.com. Folgers’s Coffee placed stickers over manhole covers so that the rising steam appeared to come from a cup of piping hot coffee. Advertising on the gates that guard parking ramps. QR codes on the rooftops of buildings. Have a 2-minute drill: Divide students into teams of two or three people (sitting by each other). In two minutes, have them list ALL the places they have seen advertising, especially unusual places. Click on the links in the Ad Age article to view the media placements. Encourage students to think out-of-the-box. What would be wild places that ads could be placed? 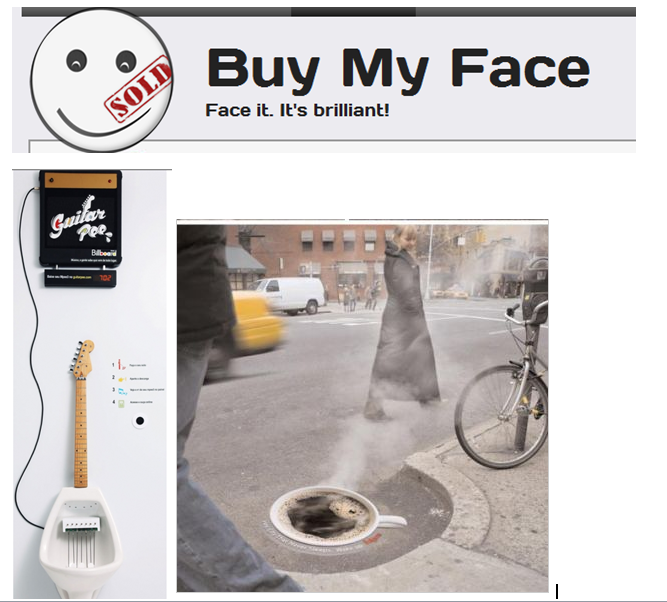 Have students examine the Web site: www.buymyface.com to learn of an unusual business by two broke college students. Have students practice their skills. Give them a list of common products (e.g., Tide, Coach purse, Nike shoes, Hershey’s Chocolate, Jockey underwear, etc.) and have them come up with three very unusual places for advertising the products. Be creative!